Monday already?!?! Where has time flown by too! Last week was insanely busy! It seems like my days has ran together. This weekend was a wild whirlwind of a flare and church things that needed to be done! my youngest 18th Birthday Saturday. My babies are no longer babies, but beautiful young woman. Well I will stop my rambling and get on with my favorite link-up! 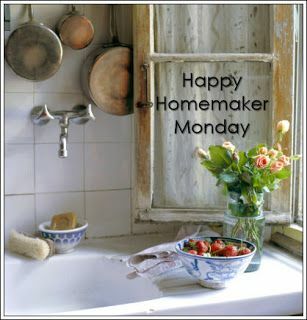 Head on over and join on the fun at the Diary of a Stay at Home Moms Happy Homemaker Monday! There are some amazing ladies blogs that I love reading behind! just click below to join in! Man I really wish spring would come and stay! I am really ready for 70 degree weather. Morning on the patio sipping coffee and having breakfast outside. You can almost see spring whispering outside, that it is ready to come... However old man winter is not ready to let go quite yet! even though its kinda gloomy out today. The hwy is busy... It makes me want to slow down and enjoy the day around me... Instead of rushing through one task to another. The TV remotes, a yeti full of cold water,and my cell phone. Honestly I have nothing at the moment... Life has been so busy I have had no time to even choose a book to read... I look forward to summer and the hopes to have time to read. I need to catch up on Alienist and When Calls the Heart. I binged watched Murder Maps on Netflix at night last week! I really enjoyed it. Monday- My husband is fixing his special chicken dish! Wednesday: Pork Chops, mashed red potatoes and herbs, with a side salad. I hope to begin taking one room at a time and spring cleaning till the whole house is done! I can sure tell its been lived in this week... It will be okay till tomorrow though.... I will tidy everything up and out it in its place then! Honestly probably not much for the next few weeks...I have a lot to get done in and around the house. The middle schoolers have been studying the solar system so all of them made nebula jars in school last week! The High schoolers enjoyed it as much as the younger ones! Our Sweet little maltipoo London was cold one morning! She normally hates to be wrapped up... She wasn't feeling well this morning and was shivering... she looked so cute I couldn't resist taking her picture. I am not gonna lie, I don't feel great today, so it is a stay in your lounge pants and oversized t-shirt kinda day. Days that are spent with out rushing around and taking each moment as it comes....These days are far and few... I do love them when I have them. Sometimes we all just need a reminder... My medicine has caused me to gain quite a bit of weight... I have really struggled with it lately... Normally I am not that girl.... I have had to remind myself that these past years has been trying ... That even if I cant loose all the weight .... Its just a number and it doesn't define me. Our Ministry, My sweet friends church Sound Side Missionary Baptist Church, My Youngest she is trying to decide what she wants to do after graduation, My oldest is trying to decide which hospital she wants to work in, there are many who are sick, also Bella who is battling cancer, and the list could go on for days. I am glad I serve a God who knows all of our request! LOVE the puppy in the blanket photo - too cute. Great inspiration also. Have a GREAT week. Great inspiration for this week. I want to make a Nebula jar! Those look super fun. Hope you were able to get some rest yesterday. Have a wonderful week! Your pooch looks nice a warm in that blanket. Our dogs have been very quiet, as I can tell they are cold too and just curled up by the wood stove. Have a great week.